If you have ever done a simple research on the best backpacks, then the name North Face might not be new to you. This company was launched in 1966 but it later merged with the Jansport to become the largest backpack manufacturer in the world. For a very long time, North Face have been known as one of the most reliable companies that focus more on the quality of their products. Backpacks from this company are very popular due to their style, durability, comfort and are also spacious. 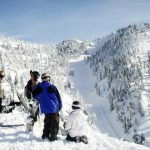 This also explains why they have continued to dominate the outdoor market for so long. The North Face targets outdoor enthusiasts and as a result, all the backpacks are made to withstand all conditions you might experience during your outdoor tours. They are more expensive than other models due to their unique quality. This article will reveal the best North Face Backpack you can find today. 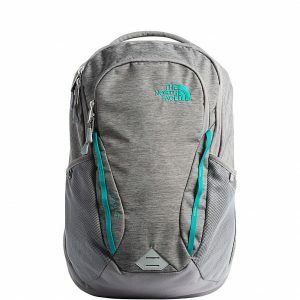 The North Face Women’s Vault Backpack comes first in our list as the best North face backpack on the market. What we loved about is that it is made of a long lasting 600D material. Again, it comes with a lifetime warranty which covers any defects on the materials and workmanship. You will also find that it features large compartments where you can keep your books and binders. The straps are specifically made for women and they even feature flexible attachments points which are contoured for the user’s torso. As a result, the backpack is suitable for women with different sizes and shapes. At the top, you will find a comfortable and well-padded top haul handle for carrying. In addition, the main compartment features a padded laptop sleeve which ensures that your items are secure in case the backpack falls. The front compartment features an extra padded tablet sleeve and it also comprises of secure zip pockets. Again, it comes with two water bottle pockets, reflective bike-light loop, shoulder strap webbing which creates a 360 degrees reflection. To prevent you from sweating, it has a padded mesh back panel and also features a breathable lumbar panel. This also makes it the best if you are planning to use it for all day activities. Lastly, it is available in different solid colors and attractive prints. 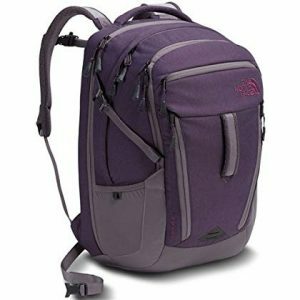 Verdict – The best thing about The North Face Women’s Vault Backpack is that it comes with a lifetime warranty. This gives you an assurance that it will serve you for many years. This one comes second as one of the best backpacks you can rely on. What we liked about it is that it features front compartments which has a fleece-lined media pocket and secure zippers. Additionally, this compartment also features an elastic webbing for managing cords. The secondary compartment is where you can keep your books and binders. Another thing is that the backpack has a well-padded, fleece-lined tablet sleeve which is also located in the front compartment. In addition, it comes with a secure fleece-lined laptop compartment. The shoulder straps are specially designed for women and they also feature flexible attachment points that enable the backpack to fit women with different body sizes and shapes. Again, it features a FlexVent suspension system which comprises of a padded mesh back panel and a custom injected-molded shoulder straps. Apart from that, it has a reliable spine channel which provides an ergonomic fit. The wicking lumbar panel provides maximum support and ventilation. Other features include; 2 external vertical zippered pockets, internal mesh zippered pockets, external fleece-lined pocket where you can keep your electronics or sunglasses. The backpack also comes with a removable waist belt, sternum straps, a comfortable and a well-padded top and face haul handle. 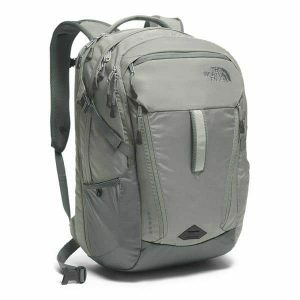 Verdict – This North Face laptop backpack is suitable for anyone in need of a comfortable backpack. The removable waist belt makes it easy to carry. Here comes another top quality backpack for those in need of a spacious backpack. It features a large compartment where you can keep books and binders. The front compartment features a padded tablet sleeve. Again, it has a pendolier and features very secure zip pockets. In addition, you will also find that it has a protective laptop compartment. We also found that it features front extendable stash pockets where you can keep different accessories. The backpack also has fleece-lined pocket where you can keep your sunglasses, keys or phones. Apart from that, you will also find two mesh water bottle pockets which you can use for different purposes. Again, it has a quick draw phone access located on one side. The other awesome feature you will find in this backpack is the updated Flex Vent suspension feature which has an inbuilt flexible yoke that is made of a custom injected-molded shoulder straps. For maximum breathability, it features a breathable lumbar panel and a comfortable mesh back panel which keeps you comfortable all day. The shoulder straps are very flexible which means that it fits easily on women with different body sizes. Other features include a removable waist belt, sternum strap which features a whistle buckle. 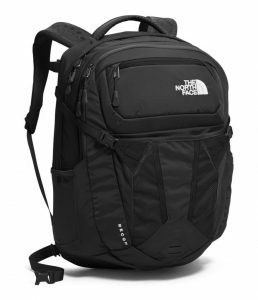 Verdict – This one is among the most spacious North Face backpacks you can find on the market. As a result, it is a bit heavy. One of the best things you will love about this backpack is that it is available in different colors. It is also made of a long lasting polyester material. You will also find that it has a height of 19.5 Inches and a width of 12.5 wide. The buckle closure makes it easy to carry. In addition, it also comes with a water bottle tabs, reflective bike light loop and reliable shoulder straps which provides a webbing of 360 degrees reflectivity. In addition, the backpack comes with a sternum strap which has a whistle buckle and a comfortable padded top handle. The Flex Vent provides the required support and also allows you to carry a decent load due its size. Again, you will also find that it features a well contoured space which allows you to pack your items easily. It also comes with pen pockets and a laptop sleeve. However, the water bottle pockets are not the best. If you are searching for a backpack that you can use to carry books and binders, this one might be a great choice since it has a large compartment which is made for that purpose. Another impressive thing about it has a laptop sleeve which protects your items in case the backpack falls accidentally. If you are planning to carry your water bottles, the backpack has 2 extended mesh bottle pockets. Again, it features a breathable lumbar panel which keeps you comfortable all day. Verdict – The North Face Jester backpack is one of the rare backpacks you can carry all day without getting fatigued. It also comes with multiple pockets where you can keep different items. This one is made of a 500D Cordura nylon materials which enables it to withstand harsh conditions. 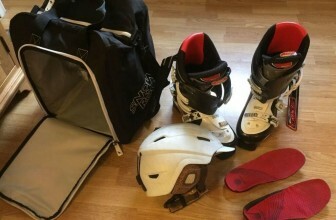 The material is also resistant to abrasion and also contributes to the durability of the backpack. If you are intending to use it as a school bag, you will be happy to note that it comes with large compartment suitable for keeping books and binders. In order to give you a quick access to your items, it has a fleece-lined tablet sleeve which is located in front of the compartment. The fleece-lined laptop compartment ensures that your items are safe and secure when you are travelling. Again, the front compartment also features a fleece-lined media pockets and secure zipped pockets. In addition, it also comes with elastic webbing for cord management. The FlexVent suspension system comprises of an injected molded shoulder straps and a well-padded mesh back panel which has a spine channel. For maximum support and ventilation, it features a wicking lumbar panel. 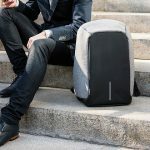 For tech savvies, this backpack is undoubtedly the best you should consider because it comes with specialized pockets where you can keep different gadgets without worrying about their security. It is a bit expensive but the good thing is that you will get value for your money. Verdict – This one is the best for business professionals who are in need of a quality backpack they can use to carry a laptop or a tablet. It is also made of top quality materials. 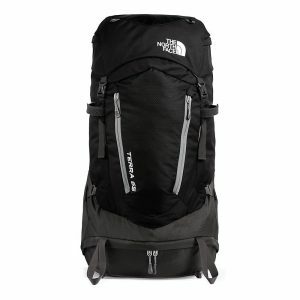 The North Face Terra 65 is another reliable backpack for avid users who enjoys outdoor activities. Several measures have been put in place during the production of this backpack to ensure that there is adequate load distribution. The design is user-friendly and you will also find that it has a well-padded straps for additional comfort. In terms of durability, the backpack is made of a 600D polyester material and 420D mini ripstop nylon. In addition, its construction also features an extra 1200D polyester. The combination of all these materials means that it is able to withstand even the harshest conditions without breaking down. In terms of comfort, this backpack ranks as one of the top quality backpacks in the industry. You will find that it incorporates different enhancing features which allows it to remain lightweight and comfortable throughout its usage period. Unlike other backpacks, this one features an OPTFIT system that gives you better load control and also ensures that there is proper load distribution. This allows you to carry it easily even when you are carrying heavy loads. The other thing you will enjoy when using this backpack is that it comes with multiple pockets. These pockets are made in a way that allows them to accommodate different items. It is worth mentioning that you can easily carry up to 65 liters of items without straining. Again, the vertical design comprises of more than 7 zipper pockets. It also has a large zipper side pocket which gives you access to the main compartment. Verdict – This backpack is one of the best for outdoor enthusiasts. It has a nice design that allows it to withstand harsh conditions. The only problem is that it is not waterproof. If you are searching for a quality school backpack, this one might be what you need. One of the things you will love about it features a FlexVent suspension and injected-molded shoulder straps which provides the required comfort. Apart from that, it comes with a well-padded back panel which has a spine channel. This is a very important feature because it allows you to maintain your balance when carrying heavy loads. This backpack is very spacious and as a result, you can use it for different outdoor activities. Unlike others, it is made of reliable material which makes it durable and waterproof. It also comes with waist straps and chest strap and side straps which allows you to carry it comfortably. There is also a fleece-lined laptop compartment which is well padded. This compartment keeps your laptop secure in case the backpack falls accidentally. There is also a similar compartment where you can keep your tablet. You will also find a small front zip pocket which provides storage space for your phone. The pockets are easy to access and there is also a large compartment for books and binders. The elastic bungee system provides external storage. Other features includes; removable waist belt, padded top handle which is very comfortable, sternum strap which has whistle buckle and two extended mesh water bottle pockets. 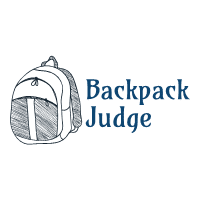 Verdict – If you are searching for a school backpack, this one will be a great option. It is also available in different colors. Below are some of the things you should look for when buying a North Face Backpack. Look for a backpack that is made of sturdy materials. If possible, look for a waterproof backpack. You also need to check the quality of the zippers, Velcro and handles. These features are very important especially when you are carrying heavy gears or books. Before buying a backpack, you need to confirm whether it is the correct size. It should not be too small or too big for you. Also, you need to choose according to the intended purpose. If you are searching for a school backpack, then you do not need a big one. On the other hand, if you need a backpack which you can use for outdoor activities, it should be spacious enough. 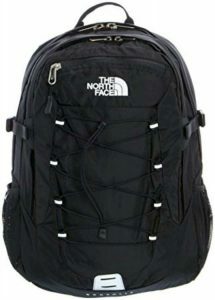 You will find that North Face backpacks come in different colors and designs. 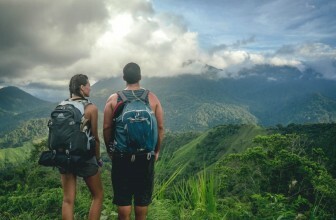 Some backpacks are specifically made for men and others for women. If possible, look for a unisex backpack which is comfortable for everyone. You also need to choose a suitable color. You also need to check the type of straps that comes with the backpack. They should be adjustable and easy to wear. They should also be flexible in terms of the material and length. The FlexVent suspensions are very flexible since they help in stress reduction. Also, the injected molded straps provided additional comfort. It is good to check the number of compartments to ensure that the backpack will accommodate most of your items. A good backpack should have a laptop compartment and a tablet compartment. The laptop sleeve should be very secure to ensure that your gadget is safe even if the backpack falls accidentally. The other thing you need to check is the inclusion of extra padding the fleece-lined pockets. 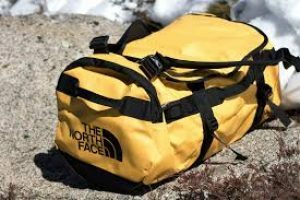 North Face backpacks are available in different prices because they come with different features and are also made of different materials. You need to consider the material used to make the backpack, features and size for you to make the best decision. Most of the expensive backpacks are durable because they are made of sturdy materials. You should not forget to check what most of the customers are saying about the product. It is also advisable to check the products’ rating and number of reviews. You can easily determine the quality of a backpack just by checking the warranty details. A quality backpack should have a warranty of at least 3 years. 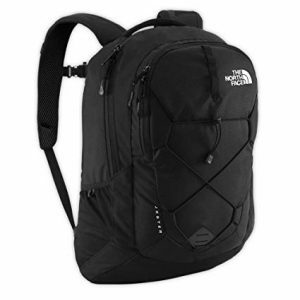 If you are in need of a quality backpack with a high functionality, North Face backpacks are unbeatable. They may be a bit expensive than other models but their quality is incomparable. They also come with a lifetime warranty which means that they are highly reliable. 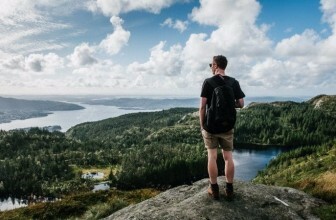 Whether you are searching for a backpack you can use for camping, hiking, schooling, business or any other activity, you can pick any from the ones we have reviewed above. All of them are durable, comfortable and spacious enough to accommodate different items. You can also choose any that suits your budget but you need to check the size.